﻿﻿Programme Mile End﻿﻿ offers a variety of ways for students to reengage with school. 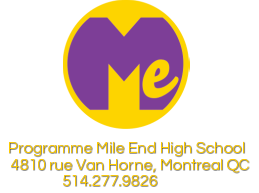 Its a school that's for students between 15 and 18 years of age who have not met with success in other high schools.We work with students to help them get back on track academically in order to either obtain a Secondary School Diploma leading to further studies in CEGEP or to pursue vocational training. We also offer opportunities for students to explore a variety of career options and to gain hands-on experience in a work environment while meeting specific educational requirements. Fundamentally, we believe that the measure of success should be different for each student.